Why Does My Kid Get So Many Cavities? Does it seem like each time you take your child to the dentist, he or she has another cavity or even multiple cavities? The cavity streak makes your child fearful of the dentist and it troubles you to see your child so unhappy. You want to help your child from getting more cavities, but you don’t know for sure what is the reason behind their chronic cavities. Poor, at-home oral hygiene. Do you watch your child brush his or her teeth and check their mouth afterwards? Small children often miss many spots when brushing as they are learning the right toothbrushing techniques. Children should also floss between their teeth. 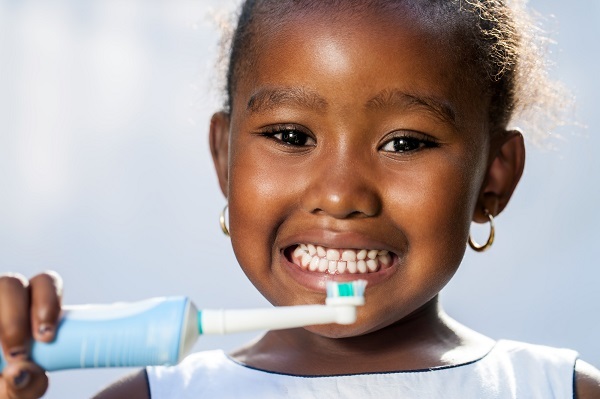 Make sure your children brush their teeth for two minutes twice per day with kid-friendly fluoride toothpaste and a soft-bristled toothbrush. Some children get cavities because their parents neglect their oral health care because they think baby teeth aren’t important and will fall out anyway. Little do parents know that cavities of the baby teeth can carry over and infect the permanent teeth that replace them. An unhealthy diet of processed and sugary foods and drinks. It may seem like a no-brainer that a diet consisting of sugary, carb-heavy, processed foods, drinks and candy will lead to cavities. Yet, some parents still feed their children such unhealthy diets either out of convenience or to make their children happy. Parents of infants can make their children susceptible to cavities by letting them go to bed with a bottle of milk or juice. Uncontrolled snacking. Little stomachs are, well, little and need seemingly constant refueling. If your child isn’t fed, you can expect a fussy, angry temper-tantrum in the near future. Many snacks marketed as healthy are not necessarily healthy. Crackers and dried fruit are loaded with sugars and their stickiness can leave a lot of food debris on and between teeth that can lead to cavity-causing plaque buildup. Not drinking enough water. Kids naturally don’t prefer water because it is bland tasting and doesn’t taste sweet. Water, however, it the best liquid to rinse the mouth out. To lessen the risk of plaque build-up, drinking some water after each meal and snack is encouraged. A late start to visiting the dentist. We encourage parents to bring their children into the office by their first birthday for an examination and to get them comfortable with the dentist office. By the age of three children should come in for their first dental cleaning. Some parents will postpone taking their children to the dentist for a cleaning and examination. Combined with poor, at-home dental hygiene, this waiting to see the dentist may be too late to halt a cavity that has gone unchecked for too long. A need for orthodontic care. Crooked, missing or misaligned bites can provide more hard-to-reach areas in which plaque and tartar can build-up in. The longer orthodontic work is postponed, the risk of cavities will remain high and your child’s smile will become harder to enhance and improve in the future. Knowing what the possible causes of cavities are can help you take appropriate steps to preventing them in the future. Cavity prevention starts at home and our dental professionals would love to help you be better equipped to improve your child’s at-home oral hygiene. Contact us today to schedule an appointment for your child with our dental professionals and let us help your child end his or her cavity streak.